Patrisha Polacco essay | Jessica's World! Don’t let people keep you from conquering your goal. In the books My Rotten Redheaded Older Brother by Patricia Polacco and Thank You Mr. Falker also by Patricia Polacco, Trisha in both stories cannot let people doubt her or else she wouldn’t have reached her goal. In the stories she has gone through people doubting her, mean brothers/bullies, changings, and persevering through tough times. In both stories Trisha goes through people doubting her. In My Rotten Redheaded Older Brother, Richie, Trisha’s older brother, was doubting that she could do anything better than him. A supporting detail is that Richie said “Bet I could pick more blackberries than you can” and “Can so”. In Thank You Mr. Falker Eric the bully was doubting that Trisha would ever learn to read.He did this because she didn’t know how to read, was really behind in reading, and she wouldn’t stand up to him. He even said “Toad!!”. These examples show that in both stories Trisha goes through a lot of people doubting her. In both stories the brother/bully is nice in front of other people but mean when they are alone with Trisha. In My Rotten Redheaded Older Brother Richie was super nice in front of their grandmother but mean in front of Trisha alone. A supporting detail is that when they were in the kitchen altogether, Richie was not being mean to Trisha, in fact he was very kind to her. But then the next day when they were alone, “A traveling carnival! They’re setting up right here in our field! Bet I could eat more hot dogs than you”, he said. In Thank You Mr. Falker Eric is not teasing her in front of Mr. Falker, but when they are alone he pulled her hair. A quote from the book is “He waited by the door of the classroom for her and pulled her hair”. These examples show that in both books, the brother/bully is nice in front of other people but mean when they are alone with Trisha. In both books, the mean brother/bully change. 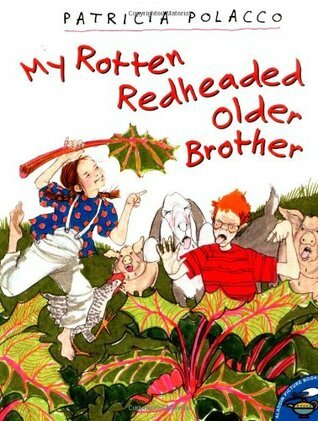 In My Rotten Redheaded Older Brother, Richie was mean to Trisha but then helped her when she fell. A detail that supports this is when their grandmother said “Your brother carried you all the way home, and then he had to run to get Dr. Lee”. In Thank You Mr. Falker, Eric the bully bothered Trisha a lot, but when Mr. Falker caught him, he stopped for a while. This means that when Mr. Falker caught him, he must’ve realized that what he was doing, was wrong. These examples show that in both stories, the mean brother/bully change. In both stories Trisha goes through people doubting her, a mean bully/brother, and changes. Don’t let other people keep you from conquering your goal. This entry was posted in 5th Grade, Class Books, Reading, Writing. Bookmark the permalink.